Fast food: convenience or just lazy? Has fast food got too convenient? The industry which literally feeds the worldwide demand of fast food has, and remains to be, one of the more rapidly developing industries to date. Food has never ever been more accessible to people. 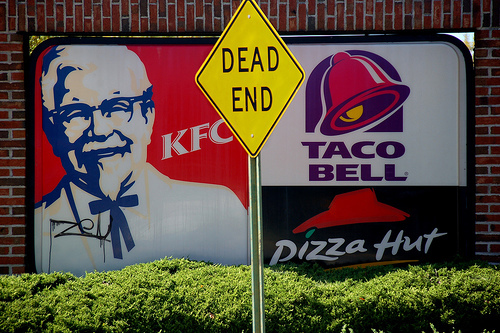 American corporations such as McDonalds and KFC are now globally recognised and super-powers in the fast food industry, alongside other familiar saliva-inducing names such as Burger King, Subway, Pizza Hut and more. With these Westernised eateries cropping up in even the most un-Westernised of locations, there’s no escaping the grip of the fried foods. Granted, not all are fried, but you get my drift. Not only are they endorsed by some of the biggest, also globally, recognised events such as the Olympics and World Cup, they are moving quickly alongside media and advertising developments to gain the best and most highly popular advertising methods to ensure that their global power continues to be present in the daily lives of, well, everyone. Advertising has become vastly more up-to-date and, through cause of need, moves with the social and cultural norms and discourses of our times. As they find increasingly confident ways to relate and appeal to the audience, it’s inevitable that their popularity will never drop, even in tough economical climates and landscapes. With their weekly deals, cheaper menus and special offers, all fast food restaurants find themselves in a consumption crusade, racing against each other to discover ways they can appeal to the masses. Smoking advertisements were banned in the UK in 2002, with the aim of cutting the number of deaths a year from smoking. The advertising was, obviously, endorsing a product which can, if consumed in large quantities, can eventually kill you. In fact, research has shown that it needn’t even be great quantities for cigarettes to kill you. So, in the same vain, should we forget that too much fast food (which no, is not healthy for you. Even the ‘healthier’ options) can lead to obesity and a whole host of obesity related illnesses? Talks in the past decade in the UK have heard the Government discuss the banning of confectionary adverts in the time periods most likely to gain the attention of children. But when it comes to fast food, it seems that it’s viewed with a totally different set of eyes. Despite the fact that it can kill you, adverts are allowed, endorsements are welcomed and it’s become everso much more acceptable for sportsmen and women and sports events to work with fast food restaurants to advertise the ‘healthier options’. Now, we all have opinions, but as this is my blog, I intend to share mine… These options are, in comparison to the rest of most menus, the healthier option. But in comparison to a normal healthy-living diet and lifestyle, they probably aren’t. The idea that sport-related events and people are connecting through advertising with these restaurants is silly, and effectively sending the message that the products they sell are healthy. The way they go about getting people in, seems to be focusing on the food and consumption issues which have been prevalent in society i.e. local grown foods, freshly used and healthy eating. Adverts now show that their products are, in some way, good; whether it be for the local farmers or your bodies. The rapid-serve restaurant can be traced back to America, 1912, with the grand opening of the Automat in New York. Producing food from behind glass counter, with coin-operated slots, the first fast-food restaurant was born. Little did they know that within 100 years, what they’d created would become an international consumption phenomenon. The second leg of the convenience food race was completed by the creation of the drive-thru. Whether with a human at a window, or speaking to a microphone, the ultimate in convenience food was designed. Now, without evening leaving the comfort your own car, you could pick up a bucket of fried chicken and chips or a double mega bacon with cheese and more bacon burger whopper on that freezing cold and rainy night. AS simple as that, with not even popping the car door handle. The date of the first drive-thru is hazy, and many websites and companies lay claim to it, however the general consensus seems to linger around the year 1948, where the complete fast-food experience was created. Now, through all the innovative and convenient methods to which fast-food has delved, and all the developments the whole industry has been through, comes another way of getting your food without wandering out into the windy and cold weather. But this time, it’s on a whole new level of lazy. There, I said it, the whole discourse and ideology of fast food restaurants is convenience, which can be translated into lazy pretty easily. Lazy to not buy the ingredients; lazy to not prepare them and lazy to get it all in the same place. But here’s a thing, a revolutionary method of getting your food to your door without literally moving from your room. Online ordering websites, such as justeat.co.uk have been cropping up in the past couple of years, and before we’ve realised what’s happened, a whole new chapter of fast food delivery systems has thrust itself upon the nation. No more will we even have to go to the doormat for that flimsy, rain-soaked freshly delivered Chinese take-away menu, oh no. Just get yourself online which, lets be honest, most people are nowadays, and view all the fast food joints in the local vicinity, complete with their menus. It’s odd- you’d think a drive through is height of convenience, but apparently not. Not only is the craze spreading to coffee houses, pharmacies and ATM machines, it’s taken form in online order forms with multiple methods of pay. It really has never been easier to get hold of food. You see it on TV, you order it online, it comes to your door and you stuff your face. It really is that simple. And we constantly watch documentaries about obese people, and see the latest published figures on child obesity, but is all the moaning achieving much?… Could more be done with the introduction of a cut on advertising and the somewhat obvious pleas to the masses to come and purchase some fried food. We talk the talk about reducing obesity, but are we walking the walk? No, we’re waddling, after those three burgers.